If you require an additional storage unit but has space constraint, this jewelry cabinet armoire from us gives double benefits. 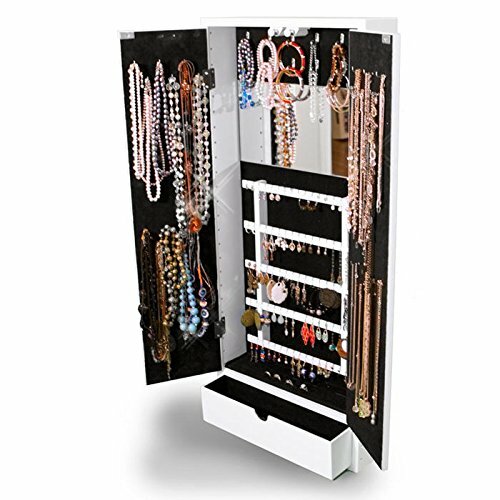 This product is a great showpiece of your precious jewelry collections without requiring a floor space. The display cabinet also features a full size cheval mirror that acts as your dressing mirror as you prepare and look best for a night out. This showcase exhibits beauty, elegance and functional design to serve for long time. The case is made from sturdy wood MDF, glass and MDF paint finish. 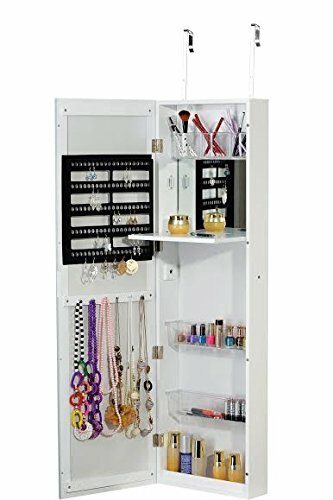 When you purchase this showcase you can fully enjoy storing your wide collection of jewelries, watches, bangles, necklaces, earrings, studs and other accessories without worrying about losing or organizing these pieces. This hanging cabinet showcases a generous space to store all your items on its shelves, elegant hooks, trays and compartments with convenience. This is the perfect storage unit for your personal collections such as cosmetics, watches, bracelets, perfumes, glasses and other important collections. From now on, you can expand your collection and save money from ordering directly from the manufacturer. 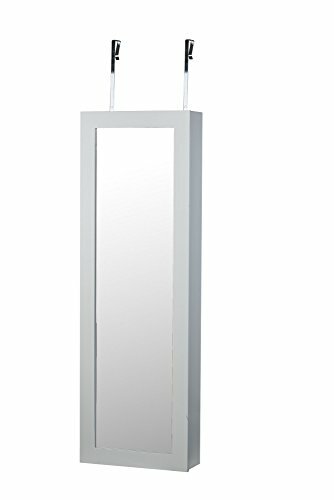 This product is 44 inches high x 13 inches wide x3.5 inches deep, solid furniture pattern and a decent exterior mirror. 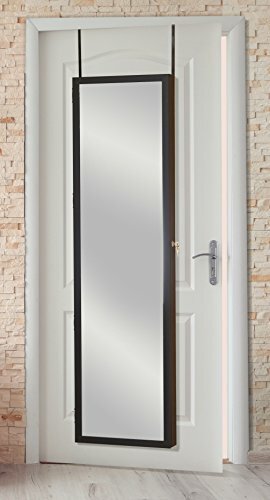 It is perfect for door or wall mounting in different areas of your home including bathroom, dressing room, living room and bed room. This product can also be a valuable retail fixture to store and put an elegant display of promotional items including jewelry, cosmetics, watches and other accessories. It allows your customers to conveniently browse your collections through its one wood shelf, three interchangeable trays and hooks that hold your necklaces, bracelets, studs and earrings. The case also comes with a sleek door and locking system for additional security. 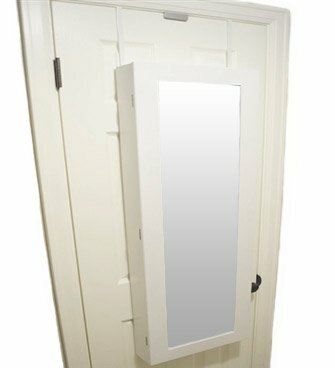 The overall design and white finish makes this cabinet armoire perfect to any interiors in home or retail setting.